The Thistles Shopping Centre began construction in the 1970s, on the site of the 19th-century Port Mill iron foundry, and the workshops and warehouses of Mr William Kinross - 'Carriage and Motor Car builders to the Nobility and Gentry of Great Britain, His Highness the Rajah of Jowar and many other Native Gentlemen of India’. The links to Stirling's past go back much further, and are still accessible to modern shoppers and visitors...in the form of The Bastion, a 'Thieves Pot' or 'Bottle Dungeon', originally part of the Medieval Burgh Wall, which can be reached through a doorway next to W.H.Smith's newsagents. 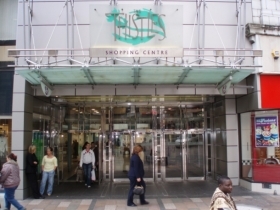 Extended in the '80s and '90s, with entrances in Port Street, Murray Place and Goosecroft Road, The Thistles is Stirling's main shopping centre, offering a selection of more than 70 chain stores and speciality shops, and easy access to the Goosecroft Road Bus Station.